Global research house, Citi has announced that it has upgraded the shares of direct to home (DTH) service provider, Dish TV to a 'Buy' rating. The research giant also said that it is revising its target price of the shares of Dish TV to Rs. 77. Citi said that the company is likely to benefit from an 2 per cent increase in set-top box prices in February and also from the increase of 10 per cent in subscriber pack prices that are set to come into effect from April. Direct-to-home (DTH) service provider Dish TV on Thursday reported its first net profit since listing. Dish TV pocketed a net profit of Rs 55 crore in the July-September quarter, as compared with a net loss of Rs 48.56 crore in the corresponding quarter last year. While operating profit jumped 18.3 per cent in the three months through September 30 year-on-year to Rs 155.7 crore, operating profit margin climbed to 29.2 pre cent during the same period. Dish TV has announced that it would offer 70 free channels for five years to subscribers who would choose its services during post digitisation. The unique opportunity has been announced for subscribers in four metros, viz. Delhi, Kolkata, Mumbai and Chennai. Dish TV, the country’s major direct-to-home (DTH) service supplier, has registered an increase of 21.2% in its standalone income, which remained at Rs524.7 crore for the three month period ended March 2012 as compared to the same period of last year. The company’s operating profit in the period under review surged 59.9% to Rs 144.2 crore as compared to the corresponding period of the last financial. Company’s Earnings Before Interest Taxes Depreciation and Amortization margin remained at 27.5%. Technical analyst Puneet Kinra of Bonanza Portfolio has maintained 'buy' rating on Dish TV India Limited stock to achieve a target of Rs 70. The analyst said that the stock can be purchased between Rs 63-66 with a stop loss of Rs 60. The stock of the company, on March 24, closed at Rs 66 on the Bombay Stock Exchange (BSE). The share price has seen a 52-week high of Rs 77.35 and a low of Rs 35.75 on BSE. Technical analyst Anil Singhvi has maintained 'buy' rating on Dish TV India Limited stock with an intra-day target of Rs 64. According to analyst, the stock can be purchased with a stop loss of Rs 58. The stock of the company, on February 02, closed at Rs 58.95 on the Bombay Stock Exchange (BSE). 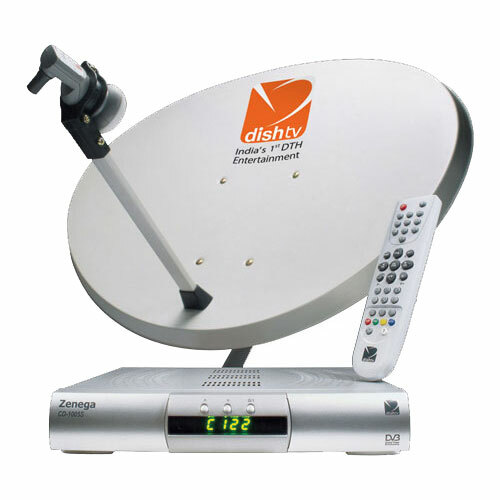 Dish TV India has announced an increase of 35% in its standalone revenues for the three month period ended December 2010. Dish TV India Limited announced third quarter fiscal 2011 standalone income of 3749 million, registering 35% increase over the same period of 2009. The EBITDA for the three month period remained at 684 million, posting over a fourfold growth as against the same quarter last fiscal. The net loss declined to 443 million as against 763 million for the corresponding period last fiscal. The company's directors during its meeting sanctioned and taken on record the un-audited standalone financial outcomes of the company for the quarter ended on December 2010. Technical analyst Parsh Zaveri of Zaveri Investments has maintained 'buy' rating on Dish TV India Limited stock with a target of Rs 75. According to analyst, the investors can purchase the stock with a stop loss of Rs 69. Mr. Zaveri said that the stock can attain the target within 1-2 trading sessions. The stock of the company, on December 30, closed at Rs 71.10 on the Bombay Stock Exchange (BSE). Technical analyst Kunal Saraogi has maintained 'buy' rating on Dish TV India Limited stock with a target of Rs 75. According to analyst, the investors can buy the stock with a stop loss of Rs 65. The stock of the company, on December 27, closed at Rs 67.80 on the Bombay Stock Exchange (BSE). Essel Group's DTH company Dish TV India Ltd named Dilip Jayaram as national ad sales head. Technical analyst Imtiaz Qureishi is bullish on Dish TV India Limited and has recommended 'buy' rating on the stock with a target of Rs 81. According to analyst, the stock can be purchased with a stop loss of Rs 67. Mr. Qureishi also said that the investors can achieve the said target within 2-3 trading sessions. The stock of the company, on Nov 23, closed at Rs 70.05 on the Bombay Stock Exchange (BSE). The share price has seen a 52-week high of Rs 71.65 and a low of Rs 35.75 on BSE. Technical analyst Manoj Sachdeva of Hem Securities is bullish on Dish TV India Ltd and has recommended 'buy' rating on the stock with a 2-3 day target of Rs 72. According to analyst, the interested investors can buy the stock with a stop loss of Rs 61. Today, the stock of the company opened at Rs 63.95 on the Bombay Stock Exchange (BSE). The share price has seen a 52-week high of Rs 70.90 and a low of Rs 35.75 on BSE. As per latest figures, more than 9 million subscribers in India are using direct-to-home (DTH) player called Dish TV. The officials reported that around 1 million subscribers have joined the Dish TV within past three months. With this large number of subscribers, Dish TV turned Asia's largest DTH Company in the Indian DTH market. The officials are expecting that Dish TV will cross 10 million subscribers by the end of March 2011. Stock market analyst Amrut Deshmuk of Way2Wealth has maintained 'buy' rating on Dish TV India Ltd stock with targets of Rs 60 and 70. According to analyst, the interested investors can buy the stock with strict stop loss of Rs 48. The stock of the company, on August 18, closed at Rs 50.70 on the Bombay Stock Exchange (BSE). The share price has seen a 52-week high of Rs 52 and a low of Rs 32.95 on BSE. Dish TV has made announcement about the launching of region- and language-specific packages for south. The Dish TV Q1 FY 11 Results have declared today and the company has experienced an EBITA of Rs. 391 Million which has been up by 85.3% on YOY basis. The DTH player has also added a total of 0.64 million new subscribers during this period. This has clearly made the company the 6th largest DTH player in the country with a market share of 25%. The Direct to Home (DTH) arm of Zee group has appointed R. C. Venkateish as the new CEO of the company. Having worked with top international brands in the past like Smithkline Beecham, Nestle India, Gillette, Kellogg India and ESPN Star Sports, Venkateish brings a total of 27 years of rich experience with him on board for the company out of which for around 12 years he has served many global brands. His last position was with ESPN Star Sports, where he was serving as the Managing Director India and South Asia for the company and looked after the business operations of the company in these markets. Dish TV a popular name in Indian television is all geared up to increase its current list of subscriber base. As Subhash Chandra states, India's DTH market will expand exponentially and the current arena witnesses multiple players spending a good amount on promoting the various ventures of satellite reception. The current stats reveal that DTH has already surpassed the 7 million subscribers mark and is targeting another 2.5 million in the years to come, as stated according to Jawahar Goel, CEO at Dish TV. Dish TV India reported a net loss of Rs 76.21 crore for the quarter ended December 31, 2009 against a net loss of Rs 118.05 crore in the same period last year. Total income of the firm stood at Rs 277.46 crore for the third quarter against Rs 192.79 crore in the same period previous fiscal. The net sales of the firm rose to Rs 277.2 crore for the quarter against Rs 257.3 crore quarter to quarter. Dish TV, India's first direct to home (DTH) service provider has registered a net loss of Rs 56.13 crore for the second quarter ended September, compared with net loss of Rs 154.11 crore of the year ago period. Further, the total income of the company stood at Rs 257.49 crore at the end of September quarter of the current financial year, whereas the same was at Rs 173.29 crore during last year. For the half-year ended September 30, 2009, Dish TV posted a net loss of Rs 125.34 crore, against net loss of Rs 279.55 crore during the corresponding period last fiscal. Dish TV, Country's no 1 DTH company, has informed that it has entered into an alliance with Internet job portal Monster. com to offer an interactive jobs search service 'MonsterJobs Active' to its subscribers. The latest partnership would allow job seekers to search for jobs across the country. Dish TV expects that about 10 to 15 per cent of its 5.5 million subscribers would use the latest unpaid service, which includes resume writing and resume blaster. The service is expected to go live by the end of this month.